Malware downloader using some anti-forensics (doesn't work), UAC bypass method (uacme concept #10) and seems full of specific code for various AV's behaviour detection systems. According to VT there is no meaningful name to it from AV, yet. Loader comes probably from script-kiddie who previously worked on ransomware(s). Nick name "Phobos". Reviewed by damagelab -> https://damagelab.org/index.php?showtopic=25839 (site unavailable at the moment of post). Except uac bypass so far there is nothing interesting in this loader. 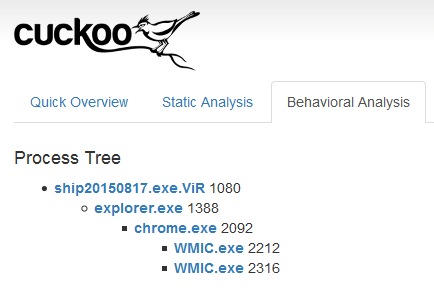 Malware injects itself into copy of explorer.exe and by using IFileOperation autoelevation (trigger UAC set on max) copies bthudtask.exe to system32\setup folder. Next it makes a copy of system dll newdev.dll, patches it with shellcode (EPO + new section) and again with IFileOperation (triggering UAC 2nd time) copies this dll into system32\setup. Next loader start bthudtask.exe with ShellExecuteEx. As result there happening classical dll hijacking and since bthudtask.exe autoelevated, malware stored inside patched newdev.dll will be running on High IL. This autoelevation method abuses way of whitelisting MS did with UAC, where it doesn't control full path to autoelevated application (while they actually must be all hardcoded) nor controlling application specific dlls loading path (even if application inside system32 you must control it too) allowing attacker do all required manipulations inside Windows folder, preparing things for successful dll hijacking. After successful elevation you will see hit-parade of spawning processes - two copies of explorer.exe for example or svchost.exe if something went wrong. That circus not suspicious at all, sarcasm. There was an interesting overview of successful/failed autoelevations in damagelab post. Statistic data show that most of people (in targeted countries) sit under default UAC settings (or with UAC turned off) even on Windows 8.1. Please don't be shy and submit sample to as many AV companies as you can. Dropper and patched by shellcode newdev.dll in attach. Fun to see 'Aerosol' ripping content form here. Muhaha he copy-pasted word by word. H1N1 Loader delivered via spam. H1N1 Loader still delivered via spam vector. • dns: 0 ›› ip: - adress: MEGAPOLISSS006.SU // domain down, but ips are still up. Does anyone have any recent samples of this loader? To test with latest Windows 10547 build which seems delivers something special for it :) Previous samples simple crash ("bydlocode" as is). Xylitol wrote: H1N1 Loader still delivered via spam vector. This one use WUSA /extract to drop newdev.dll to the system32\setup (for further use together with copied through wusa bthudtask.exe) folder and this is not working on win10 by design because /extract option is no longer valid. 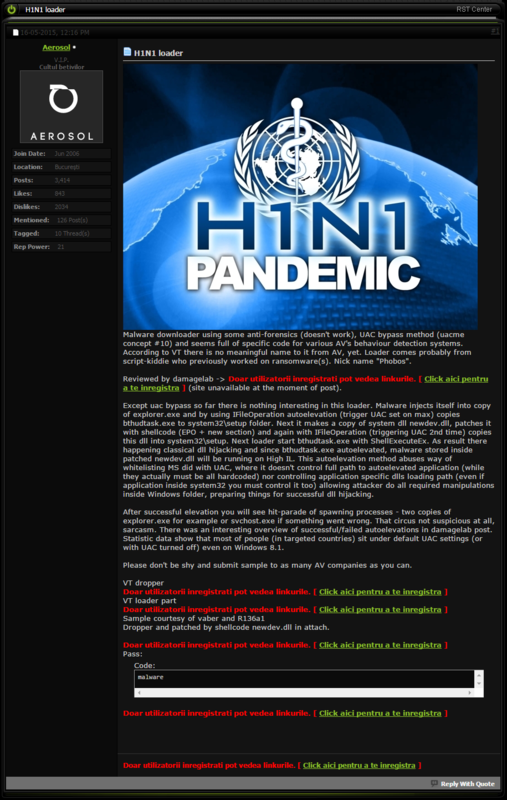 Two months ago, the author of H1N1 loader released a new version of his tool (H1N1v2) which he claims was completely rewritten. Some of the new features include a rewrote UAC bypass method and a new social engineering technique to elevate privileges if the malware runs at low integrity level. These two techniques and some general aspects of the new version will be discussed in this post. The new version of H1N1 loader is made up of an loader (exe) and a payload (dll). The loader is a x86 executable without any imports and has a small file size of 14.5 KB. It contains the encrypted and Upack compressed payload which has a size of 76 KB when unpacked. The used API functions of the loader and payload are resolved on the fly with the help of hashes instead of strings for both, library and API function names. Like in the previous version, sensitive strings are obfuscated and get also deobfuscated on the fly just before they are used. One of the tasks of the loader is to check for the OS version and the current mandatory integrity level of the process. If it runs on at least Windows Vista and the integrity level is anything below SECURITY_MANDATORY_MEDIUM_RID, the loader tries to elevate privileges with the help of WMI console application. This is done by executing wmic.exe with ShellExecuteEx() and passing the string process call create "<MalwareFilePath>" as lpParameters along with runas as lpVerb. As you can see, the dialog box without any details doesn't look suspicious at first, because a legit Windows program is to be executed. An inexperienced user might click "Yes", not expecting a malicious application will be executed in the background. However, after expending the details menu you can see the malware which gets actually executed. Finally, the old process will be terminated and the new process continues with the injection of the payload.